Ari Thór has had a little trouble nailing down exactly what it is he wants to do with his life up until now. He has dropped out of theological studies and trained to become a police officer instead. When he’s offered a job as the new copper on the beat in Siglufjörður in the lonely north of the country, a place once known for its vast herring stocks but little else, he jumps at the opportunity without discussing it first with his girlfriend Kristín even though he will be forced to leave her behind in Reykjavík. She is none too pleased with his lack of consultation but has little choice but to accept his decision. Upon arriving in Siglufjörður Ari Thór finds that he likes his new boss Tómas well enough but struggles to fit in with the rest of the small isolated community and is worried that nothing of any interest will ever happen in such a tiny place. Has he made the wrong decision to leave Reykjavík behind and will it cost him his relationship with Kristín? Only time will tell. To add to his confusion he meets Ugla, a pretty girl from the west who also knows the difficulties of being an outsider in such a close-knit town. The two of them quickly become close and his guilty conscious plays havoc with his already confused mind. When Ugla first moved to Siglufjörður she befriended retired author Hrólfur Kristjánsson and when Hrólfur dies in what appears to be a drunken accident at the local theatre Ari Thór finds that there might just be more to this sleepy little hamlet than he thought. Add to the mix a late night intruder at Ari Thór’s new house and a snow angel found in a pool of her own blood and there could even be too much action for him to deal with altogether. Ragnar Jónasson has translated fourteen Agatha Christie novels into Icelandic and is an obvious devotee of the classic mystery structure. Snowblind’s twists and turns will keep the reader captivated until the final reveal and the setting of his hometown of Siglufjörður gives the story the feeling of a locked room mystery especially when an avalanche blocks the only road in or out of town. Ari Thór is a likeable guy with his heart in the right place and with enough impulsive decisions in him to make him thoroughly believable and Ragnar’s descriptions of the local weather and wilderness are as beautiful and engaging as any Icelandic author I have come across yet. 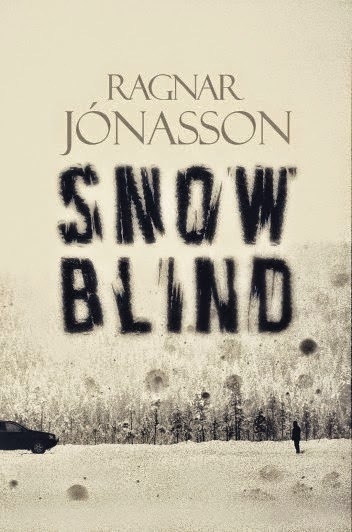 It is surely only a matter of time before Snowblind (translated quite brilliantly by UK crime author Quentin Bates) and the rest of Ragnar’s Dark Iceland series go on to take the Nordic Noir genre by storm. The rest of the world has been patiently waiting for a new author to emerge from Iceland and join the ranks of Indriðason and Sigurðardóttir and it appears that he is now here. Snowblind is available in the UK through Orenda Books from the 20 April and as a paperback from the 15 June. Grant Nicol is a New Zealand crime writer who lives in Reykjavik, Iceland. You can follow him on Twitter @GrantNicol1. I'm about to read this - not literally, next week or so. I prefer Iceland as a setting to any of the other "Nordic Noir"-labelled countries. This sounds fantastic; I'm really looking forward to it. Great review.